10 (ten) is a natural number that follows 9 and precedes 11. It is an integer and a cardinal number, that is, a number that is used for counting. In addition, it is classified as a real number, distinguishing it from imaginary numbers. Ten is the base of the decimal system. It is the total number of digits on a person's two hands or two feet. Ten is a composite number, its proper divisors being 1, 2 and 5. Ten is the smallest noncototient, a number that can not be expressed as the difference between any integer and the total number of coprimes below it. Ten is the sum of the first three prime numbers and also of the first four factorials. Ten is the eighth Perrin number, preceded in the sequence by 5, 5, 7. A polygon with ten sides is a decagon, and 10 is a decagonal number. But it is also a triangular number and a centered triangular number. Ten is the number of n-Queens Problem solutions for n = 5. Ten is the base of the decimal numeral system, by far the most common system of denoting numbers in both spoken and written language. Ten is the first two-digit number in decimal and thus the lowest number where the position of a numeral affects its value. Any integer written in the decimal system can be multiplied by ten by adding a zero to the end (e.g. 855 * 10 = 8550). The reason for the choice of ten is assumed to be that humans have ten fingers (digits). The Roman numeral for ten is X (which looks like two V's [the Roman numeral for 5] put together); it is thought that the V for five is derived from an open hand (five digits displayed). The Chinese word numeral for ten is 十, which resembles a cross. Ten is the atomic number of neon. There are ten carbon atoms in decane, a hydrocarbon. There are ten spacetime dimensions in some superstring theories. Normally, ten is the number of digits a person has on both hands (taken together) or both feet (taken together). Ten is the Saros number of the solar eclipse series that began on February 28, 2467 B.C.E. and ended on April 18, 1169 B.C.E. The duration of Saros series 10 was 1298.1 years, and it contained 73 solar eclipses. Ten is the Saros number of the lunar eclipse series that began on June 17, 2454 B.C.E. and ended on August 15, 1138 B.C.E. The duration of Saros series 10 was 1316.2 years, and it contained 74 lunar eclipses. Ten is the ASCII and Unicode code point for line feed. The Ten Commandments that God gave to Moses (Exodus 20:3-17 and Deuteronomy 5:7-21) are considered a cornerstone of Judaism and Christianity. In Deuteronomy 26:12, the Torah commands Jews to give one-tenth of their produce to the poor (Maaser Ani). From this verse and an earlier verse (Deut. 14:22), there derives a practice for Jews to give one-tenth of all earnings to the poor. Ten Plagues were inflicted on Egypt (Exodus 7-12). There are said to be Ten Lost Tribes of Israel (those other than Judah and Benjamin). There are Ten Sephirot in the Kabbalistic Tree of Life. The Bible records 10 generations between Adam and Noah, and 10 generations between Noah and Abraham. In Judaism, ten adults are the required quorum for prayer services. People traditionally gave one-tenth of their produce as tithe. The practice of tithing is still common in Christian churches today, though it is disputed in some circles as to whether or not it is required of Christians. The interval of a major or minor tenth is an octave plus a major or minor third. In rugby union, the fly-half wears the 10 shirt. In football (soccer), 10 is the jersey number of many of the best players, particularly attacking midfielders, especially players from South America. 'Number 10' player is most often used as a synonym for the team's playmaker. Ten is the highest score possible in Olympics competitions. In baseball, there are always at least 10 players on the field at a time (including the batter). 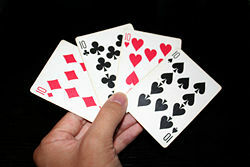 A hand holding the four 10's in a standard deck of cards: Diamonds, Clubs, Hearts, Spades. Increasing a quantity by one order of magnitude means increasing it 10-fold. Conversely, decreasing it by an order of magnitude means decreasing it 10-fold. The term decimate literally means to reduce something by one-tenth, although it is also means reducing something drastically. A group of ten items or a ten-year time period is called a decade. A decapod crustacean has ten limbs. With ten being the base of the decimal system, a scale of 1 to 10 is often used to rank things, as a smaller version of a 1-to-100 scale. Someone who scores perfectly is said to have scored "a perfect ten." Counting from one to ten before speaking is often done in order to cool one's temper. In Chinese astrology, the 10 Heavenly Stems refer to a cyclic number system that is used also for time reckoning. The ordinal adjective for ten is denary. Ten is the number of dots in a tetractys. ↑ Saros Series 10 Catalog of Solar Eclipse Saros Series NASA Eclipse Web Site. Retrieved September 29, 2017. ↑ Lunar Eclipses of Saros Series 1 to 175 Catalog of Lunar Eclipse Saros Series NASA Eclipse Web Site. Retrieved September 29, 2017. ↑ Harold Lindsell (ed. ), Harper Study Bible: The Holy Bible Revised Standard Version (Grand Rapids, MI: Zondervan Bible Publishers, 1971). 10 - Ten - 10 (Symbolic Meaning of Ten). This page was last modified on 4 October 2017, at 19:40.